What is Now Glucosamine & Chondroitin with MSM? 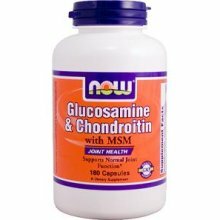 Now Glucosamine & Chondroitin with MSM is a joint supplement from Now Foods. Now Glucosamine & Chondroitin with MSM has 1100mg of glucosamine sulfate, 1200mg of chondroitin sulfate, and 400mg of MSM. We found no artificial dyes or coloring in Now Glucosamine. Glucosamine Uses 1100mg of glucosamine sulfate. Glucosamine is a precursor to glycosaminoglycans which are a major component of joint cartilage. Chondroitin Sulfate Has 1200mg of chondroitin sulfate. Chondroitin makes up glycosaminoglycans which are a component of cartilage. Methylsulfonylmethane (MSM) Only has 300mg of MSM, lower than other supplements. MSM is a vital source of sulfur for protein and connective tissue synthesis.